That image is appealing to me for its own sake, as a piece of found art, but it shows some of the difficulties in looking at old steel-frame buildings. First, the various shades of brown and tan from the steel are nearly the same as those from the terra cotta and brick. The fact that you have to stare at this picture to figure out what’s painted steel, what’s rust, and what’s masonry is a good example of why hands-on investigation is better than looking at pictures. This picture was taken at the elevator bulkhead above the roof of a steel-frame 1920s apartment house. Just left of center is an I-beam, with the right side of the lower flange trimmed off to fit a connection. The left-side flange tips of that beam are separated from the outside world by a thin layer of stucco. 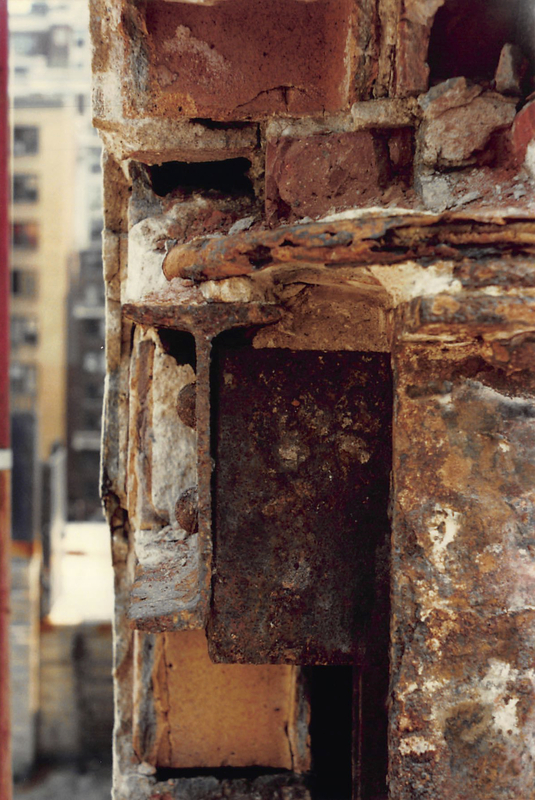 The main facades on the building have a full brick between the outside face and the flange tips of the spandrel beams, but this beam is much more exposed to water seeping into the masonry. And yet the outboard face of the beam, including the two visible rivet heads, is in good condition. Most likely it drains well, so water hasn’t been sitting there. The masonry that was removed facing us, that exposed the end of the beam, the brackets and the column on the right, was also leaking. The bracket is rusted worse, and the two rivet heads in it have lost a good amount of metal. None of this was visible before the masonry veneer was removed. There were cracks in that masonry, which are a sign of potential damage, which is why the removal took place – but there were cracks on both sides. The masonry in the area where the steel was fine was cracked, and the masonry where the steel was damaged was cracked. The crude binary of “cracked or not” simply does not provide enough information to know if steel repair is required. So we go with selective removals.